If you are in the tourism and hospitality industry and are looking to boost your business and increase your bottom line, a better marketing strategy can help. Whether you own a hotel, restaurant, travel agency, or a transport company there are things you can do to help gain visibility, attract customers, and build a loyal following. These four tourism marketing strategies can help you figure out the best way to enhance your business and stay present in the industry. The travel and tourism industry is one of the largest in the world and has experienced stable growth over the last five years. It’s also a very fragmented industry. According to a report by IBISWorld, it’s estimated that the four main companies in this industry represent less than 10 percent of the total market share. Many segments of the industry are dominated by small businesses and this facilitates access to all those who wish to build their own business. Given this opportunity, implementing the right tourism marketing strategies is crucial to stand out from the competition and to establish yourself as an authority in the industry. With all the available opportunities for growth and development, creating a solid marketing plan with the four following strategies can be your key to success and the difference between breaking even and making a profit. According to HubSpot, consumers today (among them, tourists) process more than 100,500 digital words a day. Every time they want to know something they ask Google and they can compare prices instantly in three clicks. It’s not that everyone wants to ignore your marketing messages, but given a large amount of information they are exposed to, it’s inevitable that your efforts can get lost in the shuffle. Therefore, it’s necessary to find new ways to communicate to get their attention and get them to interact with your brand. When designing your marketing messages on social media it’s not effective to only describe the characteristics of the products or services you offer. To effectively capture the attention of your target audience and generate more engagement, tell them why your service is made for them while also explaining what they will experience if they decide to buy your product or use your service. In this sense, stories have enormous power. They generate empathy, transmit confidence, are easy to remember and, most importantly, are easy to share. Storytelling is a technique that allows you to link your product or service with a concrete, symbolic and emotional experience through a story and take advantage of its full potential. When coming up with stories about your business, try to link them to your product or to the daily activities of your business in subtle ways and put them in your company’s social media posts. If your content on social media doesn’t get “likes” or isn’t shared on Facebook or similar platforms, another proven resource that can help you is creating a mascot or character associated with your brand that acts as the protagonist of your stories. 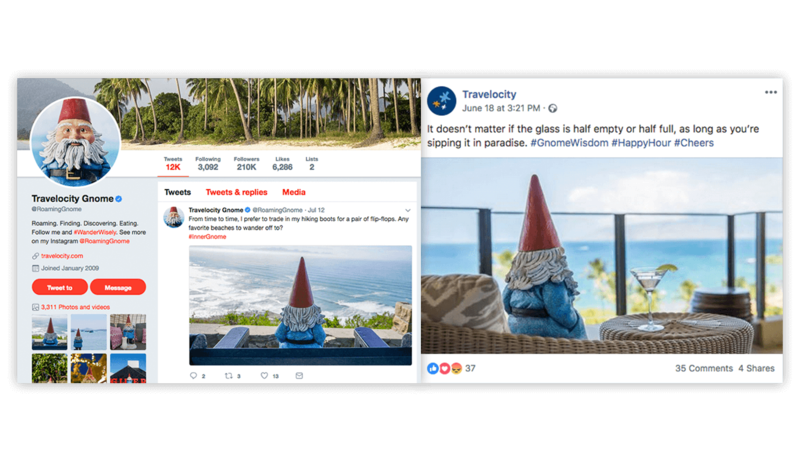 For example, the travel company Travelocity has associated a traveling gnome with their brand. He appears as the protagonist in several of their publications. 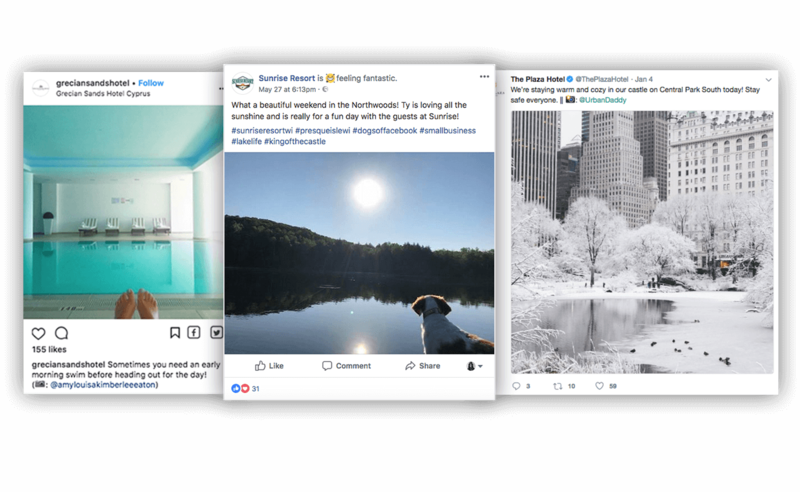 In addition, this travel company has created additional social profiles for the character including a fan page on Facebook, a Twitter account and an Instagram account through which they offer exclusive discounts to their followers. In this way, they manage to promote their trips in an entertaining way that captures the attention of the users, generates engagement and manages to create a community of fans around their character and, therefore, around their brand. On Twitter alone, they’ve got more than 210,000 followers. Within the tourism sector, offering an incredible experience is essential to get customers to remember you, recommend your brand or use your service again. Using new technologies such as augmented reality in your marketing strategy can help you create innovative and memorable experiences for your visitors and, at the same time, differentiate yourself from your competitors. Augmented reality, commonly abbreviated as “AR,” is computer-generated content overlaid on a real-world environment. Surely you’ve heard of Pokémon Go, a mobile augmented reality game whose launch in 2016 was a massive success. This game uses the GPS of your mobile to locate, capture and engage in battles with virtual creatures (Pokémon). By activating the camera, players can see these creatures through the screen as if they were in a real location. This is augmented reality. The potential of this technology in the tourism industry is enormous and many tourist establishments are already using it to offer different experiences to tourists. According to a Zenith analysis, in 2018 the pervasiveness of smartphones will reach 66 percent, which means that more than half of the world uses a smartphone. Augmented reality also offers great possibilities for the transportation industry. With a travel app with augmented reality, you could point the camera to a transport vehicle and discover your route, the next stop and places of interest you pass through, something very useful if you are a foreigner. To design a successful augmented reality app that offers a memorable experience, you must make sure it has these three elements. According to a study by Aberdeen, conversion rates are six times higher for those who adopt content marketing than for those who don’t. Since content marketing is incredibly important, to ensure you get the best results, consider hiring an SEO specialist to help you design a tailored strategy for your business is recommended. That being said, there are things you can do on your own. Here are a few basic tips to help you create a content and SEO strategy for your tourism marketing plan. Include a blog on your website and publish content that provides valuable information for your target audience: According to Ascend2, 72 percent of marketers say that creating relevant content was the most effective SEO tactic. Constructing high-quality content that provides valuable information about topics related to your tourism business (such as travel tips or interesting places to visit) can help you increase the authority of your website and, therefore, improve your positioning on Google. If you manage to publish really interesting posts, they’re more likely to be shared or linked by other sites. This way you will get high-quality inbound links that Google will look at when positioning your website. 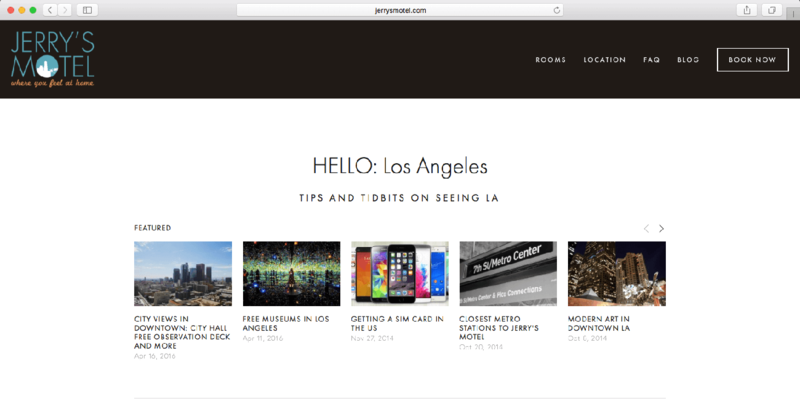 For example, Jerry’s Motel in Los Angeles incorporates a blog in its website that publishes posts with useful and practical tips for traveling to the city. Choose long keywords (more than three terms) that have a high search volume and a low level of competition: According to WordStream, 50 percent of Internet searches have four or more words. You must make sure that the keywords you insert in your content are long and describe your business, products, services or—if it’s a blog post—the subject you are dealing with. Look at the number of times users search for them. This should be a significant figure relative to your pages’ click rates. Similarly, there will be more chances of getting a good position on Google if the level of competition for your keywords is low. You have tools at your fingertips that help you discover this type of data such as the Keyword planner through Google AdWords, SEMrush or Moz. Take care of SEO on your website: There are several factors that influence to a greater or lesser extent the positioning of a website on search engines like Google. SEO experts agree that for Google to position your page or your post for the keyword you have chosen, you must add it in the beginning of the title of the page, in the subtitles, in the first paragraph of the content, repeat it several times throughout the content, in the URL, in the “Alt” tags of the images and in the meta tags (the summaries that appear in the Google’s results pages). On the other hand, you must also create internal links that allow users to navigate between the different pages of your website. You should also aim to get external links (those that appear on third-party websites and direct visitors to your website). Make sure that your website has a fast loading speed and that it adapts to mobile device screens (responsive design) as Google started penalizing non-responsive websites in 2015. Create long and interesting content: Content marketing has changed a lot since Google no longer recognizes short articles with superfluous content. Instead, it gives the first positions to websites that publish pages with long and substantiated content that provides interesting information about a topic. Several studies agree that longer pages or posts tend to get a better position on Google which translates into more traffic. 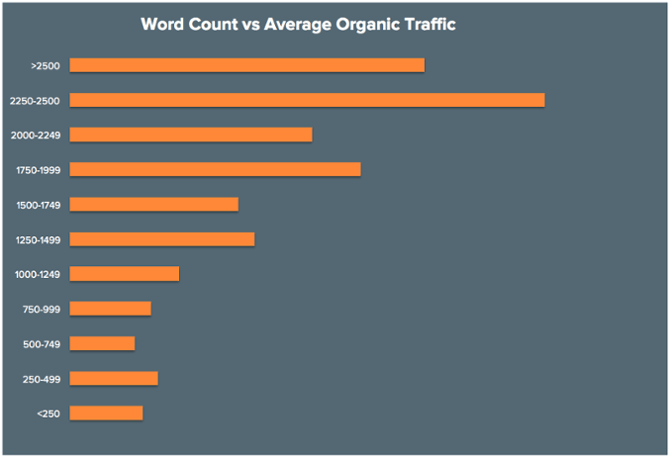 For example, HubSpot discovered that the posts that got more organic visits were those that contained between 2,250 and 2,500 words. TripAdvisor is the largest travel review platform in the world and has more than 450 million users and more than 570 million reviews. If you are the owner of a hotel, a restaurant, a theme park or a provider of tourist activities you should know that reviews play an important role in the tourist’s decision. A survey carried out by PhoCusWright reported that 70 percent of travelers read TripAdvisor reviews before choosing a hotel and that 53 percent do not decide to make any reservations before having read reviews. While it’s true that reviews can be as beneficial as they are harmful to your business, if you manage them well you can avoid having your image seriously affected by a bad review. Responding to negative comments in an assertive and polite manner is the best way to do this. 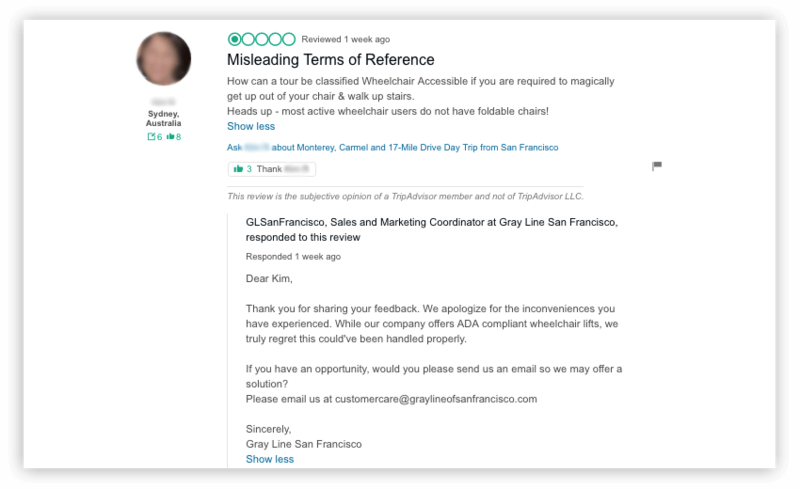 The PhoCusWright survey also revealed that 87 percent of users believe that an appropriate response to a negative review improves their impression of the establishment. Even so, you shouldn’t see criticism as a threat since the opinions of your customers can provide you with valuable information to implement improvements in your business and thus offer a better experience to future visitors. You should also know that, according to the PhoCusWright survey, 66 percent of users tend to ignore extreme comments when they read reviews, so while positive reviews predominate, you shouldn’t worry too much about the destructive ones. Taking into account that the reviews are, many times, a key factor in a tourist’s decision when booking a table in a restaurant, a room in a hotel, a tour or when buying tickets for a theme park, not having a full profile on TripAdvisor means closing doors to a community of more than 450 million users willing to discover new sites and miss a great opportunity to promote your company and generate more sales. There are also other review platforms that are gaining popularity, such as Yelp, which currently receives about 130 million unique visits and has more than 70 million reviews. Unlike TripAdvisor, Yelp is not intended exclusively for the tourism and travel industry (there are reviews on all types of businesses), but it has an important base of reviews on restaurants, hotels and other companies operating within the tourism sector. If you want to discover how to incorporate this platform into your marketing plan, read How to increase reviews on Yelp. The implementation of these four tourism marketing strategies will help you increase the visibility of your business, attract your target audience and get a better return on your marketing investment. Although these techniques can be applied in most cases within the tourism scope, take into account the needs of your business and choose those that best suit it.